Kayak expedition in a 3 days trip, to the Southernmost point in the American continent. Three days, heading towards the southernmost point in American continent Cape Froward, where the American continent ends or starts here, depending of the point of view. In this trip we go further than any road exist, we explore in a coast line that only sailors and some brave do by foot until we reach the southernmost point of the continent, we will be in very similar condition as it was for Ferdinand Magellan or Sir Thomas Cavendish the corsair, when he named cape Froward. We will confront the most extreme conditions of wind and waves in the mythic Magellan Strait, testing our kayaking skills, we will experience the real sensation to be in the wild patagonian channels, this trip is not for beginners, probably we will have to deal with storm conditions, some tall waves, and unexpected conditions during this trip, we travel all the time with a support boat that goes at distance,but reachable at the call of a VHF radio in case that we need it. In the whole route there are high possibilities to see marine wild life like sea lions, dolphins, albatross, and even some Humpback whale if we are lucky. And a beautiful landscape with evergreen forest present all the time. We depart early in the morning, at 7:00 am from Punta Arenas, there is one hour driving up to the point were we start with the kayaks, we prepare all the gear and then we go, we use a support zodiac boat to watch over the security and transport our lunch and equipment to the place where we stop for a break. In 2 hours we reach San Isidro light house, we pass by it and we continue to El Aguila Bay, where we will prepare lunch and visit the ruins in this place where it used to function a whale station in the Magellan Strait, more than 100 years ago. After lunch we continue following the shore heading south west until we reach San Nicolas bay where we will make our campsite, over there we will have time to relax, explore a bit in land and give it a try to catch our dinner from the sea, if we are lucky we could share this and a great Chilean wine bottle for dinner. The next day we continue advancing and we will start confronting more unprotected shore, we will start seeing this changes while we get closer to the end of the continent, many sailors have had to give it up and surrender to the roughness of this waters. We will make our campsite at Rosas bay just a few kilometers of cape Froward, if we have good luck with the weather we will continue to cape Froward this same day, and back to campsite, normally we will go early next day when the conditions are generally milder, when we reach Cape Froward, we will hike up the hill where the Oceans Cross marks the meeting of Atlantic and Pacific oceans, we will walk up to 340 meters high to the cross, then we will start our return, on board of the zodiac boat. In our way back we stop at San Isidro light house, we will visit the restored building and some small show of ancient pieces. At this same spot we will have lunch this day. After this we continue until we reach the place were we started the previous day. Here we put dry clothes on and we celebrate our expedition with some beer, while we put all the gear together, then we begin our return to Punta Arenas. 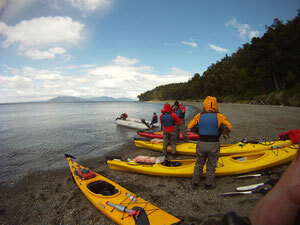 The tour includes full kayak equipment (neoprene suits plus semi dry two pieces kokatat suits that you put over the neoprene, we recommend to bring extra cloth to change, any way), bilingual guide, snack and box lunch at a camp that we set at the Magellan strait. The total duration of this trip is 3 days with some 5 to 7 hours of paddling every day and approximately 40 kilometers in total.